I am so behind in posting my photos for this challenge. In order to get caught up, I'll combine several days in this post. store in the hot pink nylon zippered pouch I picked up for a dollar at Target. And would you believe this is only half of what I have? people selling their unwanted things at great discounted prices. lots will be for my little granddaughter. Also included with the items I bought, were these cute Hello Kitty paperclips and post it notes. I'm in love with tiny post it notes for my Filofax. After this challenge is over, I'll be sharing my two Filofaxes and how I'll be decorating them using post it notes. added to the front, my laminated name divider. After I have my coffee, I will sit down to the computer with my glass of orange juice. I bought my caddy at Joanns and keep all my Filofax supplies here. Day 15: Leaning tower of planners. I keep my planners on the desk for easy referencing. I've used binders that I've gotten from my kids when the school year was finished. But I've also found great binders and file dividers at garage sales for pennies on the dollar. In the first binder on the left, this binder is holding Christmas Planner that I bought from The Organised Housewife. Which I'll be starting to work on Christmas items very soon! the True Scraps that I've attended. The third binder holds the 20 Days to Organise and Clean Your Home Challenge printouts. 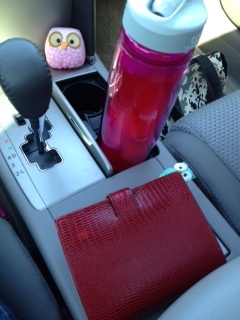 The fourth binder is a Martha Stewart binder I picked up at Staples and I don't use it but love the color! And then on the end if a photo album I tucked in also because I love turquoise/aqua! On the other side of my computer is where I keep my 2 Filofaxes when I'm home. So as you can see, not really a leaning tower of planners but I do have several planners on my desk. For more inspiration, be sure to head over to Planner Addicts on Facebook. I'm a little behind in sharing my Filofax for the photo-a-day challenge. Today it's Day 11 - Sections. Sections can be whatever you want them to be. and you can add whatever you want your sections to be. Let me show you a few of my sections. I've shared a few of my calendar pages, and that's the first section in my Filofax. 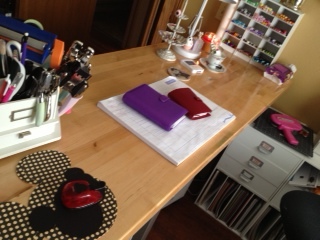 My dividers are made from the Heidi Swapp Sugar Chic collection. One of my sections is "Books to Read", how many times have you heard about a book you want to read, I've got the perfect spot to jot the name down for later referencing. I also have a section for notes, to do and CTMH. those everyday things in one compact place. Wishing you all a great Saturday. I'm a little behind in sharing my photos each day for the challenge sponsored by Toni from ABFOL. Today it's time to show Day 10 - Lists. In my pocket Filofax I have a section that I'll be moving over to my pocket Filofax this weekend. Does anyone keep lists? I find that lists are a great way to keep track of what you have and also what you need or want, or projects to do. I also keep lists for other items, such as a grocery list, which I'm not going to share today. For this page, you're probably wondering what this means, it's a list of the copic marker colors that I'd like to get and when I'm out shopping, I can quickly look to make sure I don't buy a duplicate one. These markers cost $4 - $6 each depending where I'm shopping and can be a costly mistake. This is my list of favorite songs this summer. The plan is to make a Smash page of this very soon. No reason why I used different colors other than I thought it was fun! I also put together a list of Smash ideas that I thought would be fun. would you believe I now have 3 of them now? One is about our puppy, Coco, one is about me and the other one is a surprise! Anyway, I got off topic. 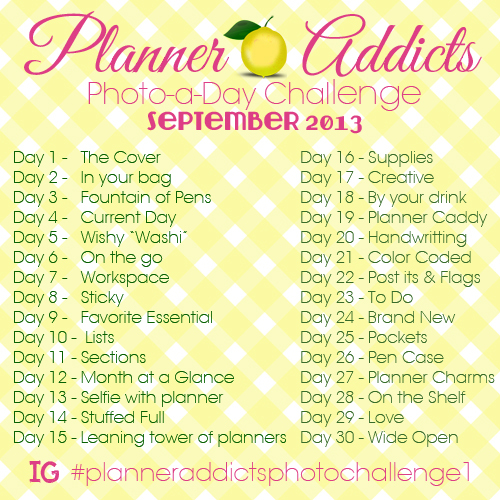 Today for Day 9 for the Planner Addicts Challenge. My pick for the favorite essential are my storage items. I thought I'd share how I organize all my stickers, post it notes, pens, washi...the list continues to grow and it can quickly get very messy. 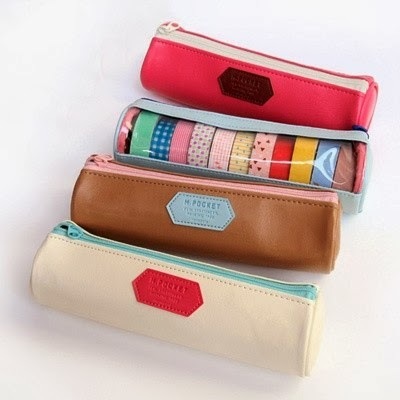 One of my big splurges was this pocket pouch from Mochi Things. I think this pouch could be used for other things too, perhaps makeup or a first aid kit. great things available, be sure to check out the dollar bins at Target.